Are you one of the many people who steal from work? CHEEKY Brits have admitted they love to pinch a ‘freebie’ from the office. More than 60 per cent say they have lifted items from work with pens the favourite loot. Post-it notes, notepads and highlighters were other favourites. 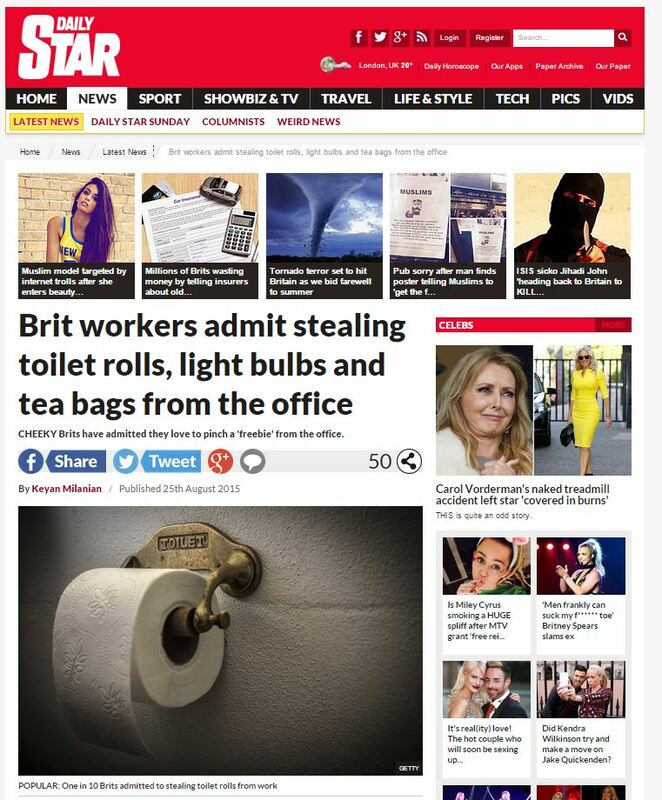 According to a new poll, one in ten admitted to stealing toilet rolls from the office toilets to take home. Are we really a nation of thieves? Or is this a slice of opportunistic PR? Staff also confessed to unscrewing light bulbs (three per cent) and taking tea bags home (six per cent), according to the survey of more than 2,000 office workers by the online cartridge retailer, CartridgePeople.com. Andrew Davies, a spokesperson for CartridgePeople.com, said: “If you’ve ever wondered why there are never any pens in the office or no toilet roll in the toilets, you now have an explanation! The costs can really add up for businesses? I suppose Andrew has a few ideas about how businesses can keep their consumables costs down, in that case. This entry was posted in CartridgePeople.com and tagged Andrew Davies, CartridgePeople.com, daily star, Isabelle Aron, Keyan Milanian, Time Out on September 3, 2015 by Michael Marshall.